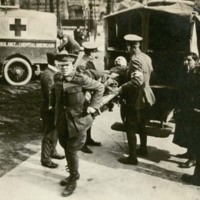 Although the United States did not enter World War I until April 1917, American medical personnel were active in war relief efforts almost from the beginning of the conflict. Harvard Medical School—its faculty and its graduates—played a key role in this work, providing staff for French and English hospitals and military units, and these early endeavors provided valuable experience once America came into the war and the need to organize and staff base and mobile hospitals for the U.S. Army became critical to the war effort. Noble Work for a Worthy End charts Harvard's participation in medical relief work and experiences in military medicine and surgery through the wealth of documentation—letters, diaries, photographs, publications, and ephemera—preserved by the men and women who volunteered their time and labor, sometimes at great sacrifice, to helping the sick and wounded of the first World War. Noble Work for a Worthy End is an exhibit curated by Jack Eckert for the Center for the History of Medicine at the Francis A. Countway Library of Medicine. The online exhibit was created in OnView in October 2016.